Old World Wisconsin opened to the public last week, as it has every May since 1976. As always, the new season brings a variety of changes intended to improve visitor experience. But this year also marks an unwanted and profound change. 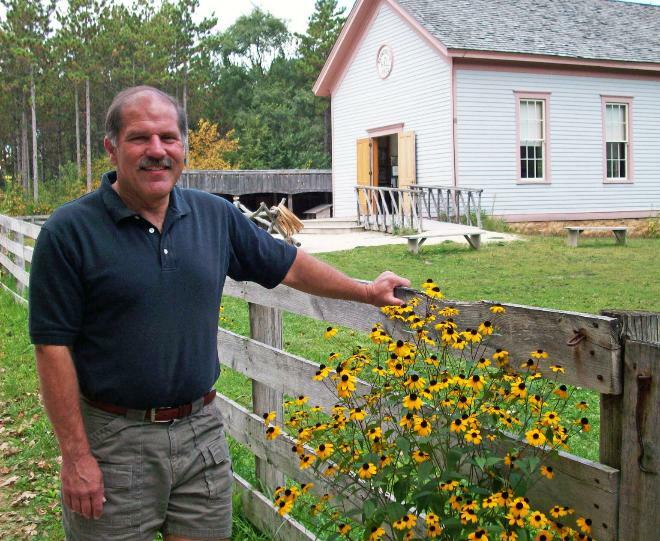 For the first time ever, Marty Perkins isn’t watching spring unfurl at the historic site. Marty started working at Old World in 1974. 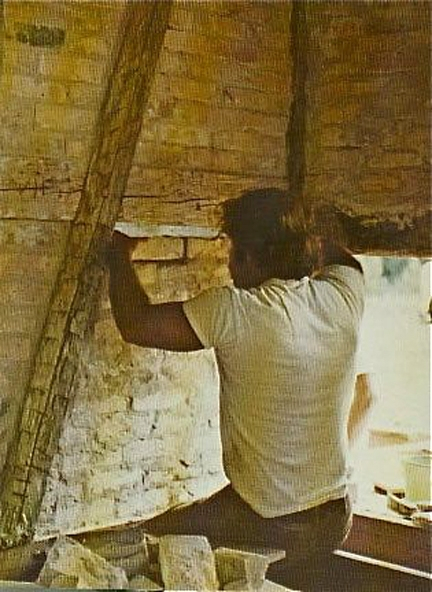 He began on the restoration crew, helping to dismantle, move, and reconstruct some of the historic structures. 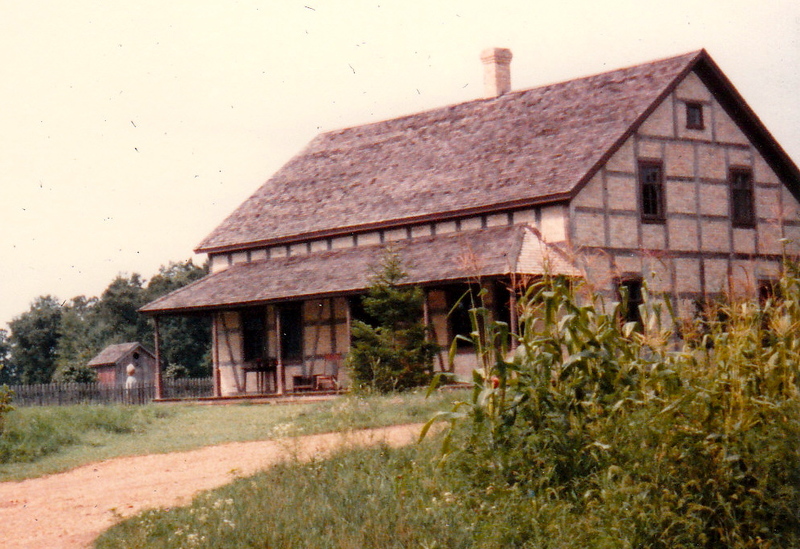 In 1975, Marty helped reconstruct the half-timbered Koepsell home in the German area. For most of his career he served as Curator of Research and Interpretation. Most recently he concentrated on his primary love, research. He loved his work. Part of his job involved driving backroads all over the state, searching for historic buildings. The people who owned the old homes or barns or shops quickly learned that Marty was a friendly, down-to-earth guy who truly wanted to hear their stories. He had a rare affinity for getting along with everyone. Marty sharing stories at the Kvaale Farm, OWW. I met Marty in 1982, when I moved to Wisconsin to work at the site. On a cold April day during training Marty gathered the German area interpreters in one of the old farmhouses. We built a fire in the woodstove and he shared tales about the buildings and the people who once occupied them. I knew I’d come to the right place. During the thirty-eight years he served at OWW, he saw many colleagues come and go. Marty chose to dedicate his professional life to the site he’d helped plan, develop, and interpret. No one knew more about Wisconsin’s ethnic history and architecture than he did. No one knew more about Wisconsin’s crossroads villages, or 19th-century baseball teams, or the workings of farmers’ clubs, or so many of the other topics he explored. Gathering facts, though, wasn’t the point. He was a storyteller. After Marty died suddenly last November, his coworkers referred to him as the heart and soul of Old World Wisconsin. He was. One colleague said that the site’s institutional memory had burned to the ground. That’s also true. Marty was also the site’s conscience. He knew that research had to be the foundation of everything that happened at Old World Wisconsin. That may sound obvious. But historic sites never get the funding they need, and research takes time. It is not uncommon for a distant administrator or generous donor to suggest some new program, with little thought given to what’s truly involved. At any site, loud voices can clamor for something old-timey if people think it would be fun and/or sell more admission tickets. Marty calmly and pleasantly insisted on a solid foundation of research for every new program or initiative. He helped others see that documentation wouldn’t detract from popular programming, but instead enhance the site’s educational offerings. 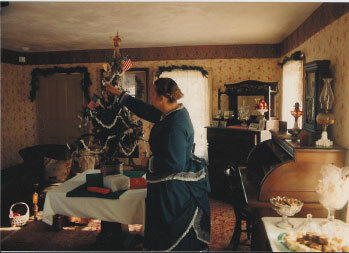 The Benson House at OWW, Christmas Through The Years, 1990. Of all the things I learned from Marty in the years we worked together, that philosophy is perhaps the most important. Now that I’m writing stories instead of greeting visitors, I try to bring that ethic to each new book project. It doesn’t matter if I’m writing an historical novel for children or fictionalizing historical events in a mystery for adult readers. Research forms the foundation of the story. 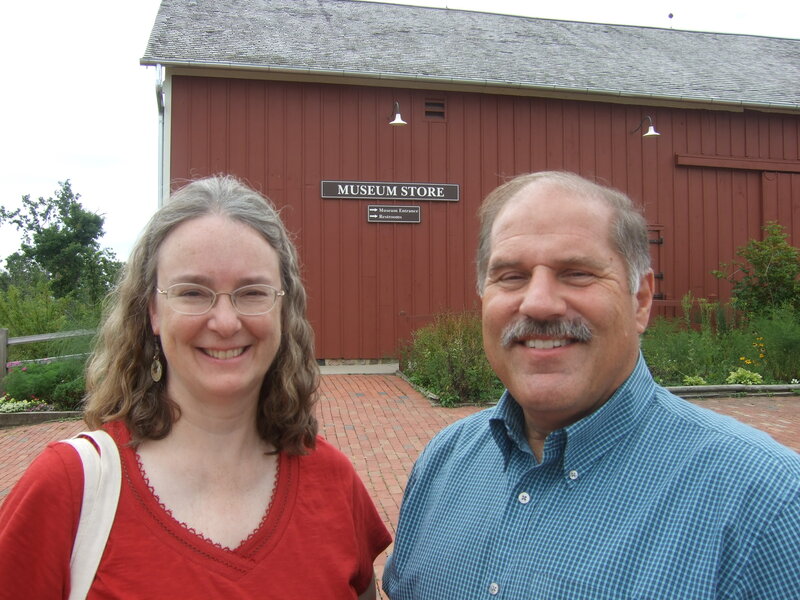 In 2012, Marty and I teamed up again to offer two History and Mystery tours at OWW. But I’m not the only person Marty mentored. 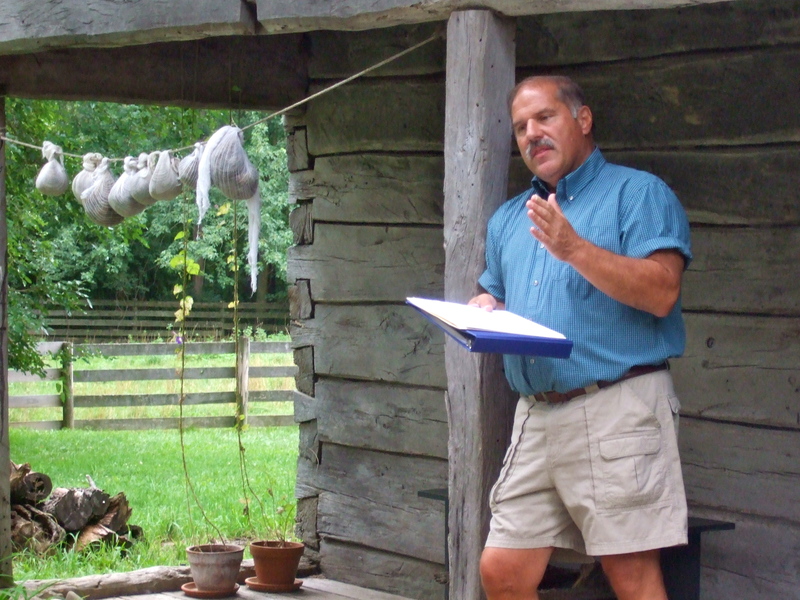 I can’t even imagine how many lives he touched over the years: how many novice interpreters came to share his passion for the site, how many colleagues developed a lifelong habit of looking for vernacular architecture on country drives, how many interns chose to make museum work a career. 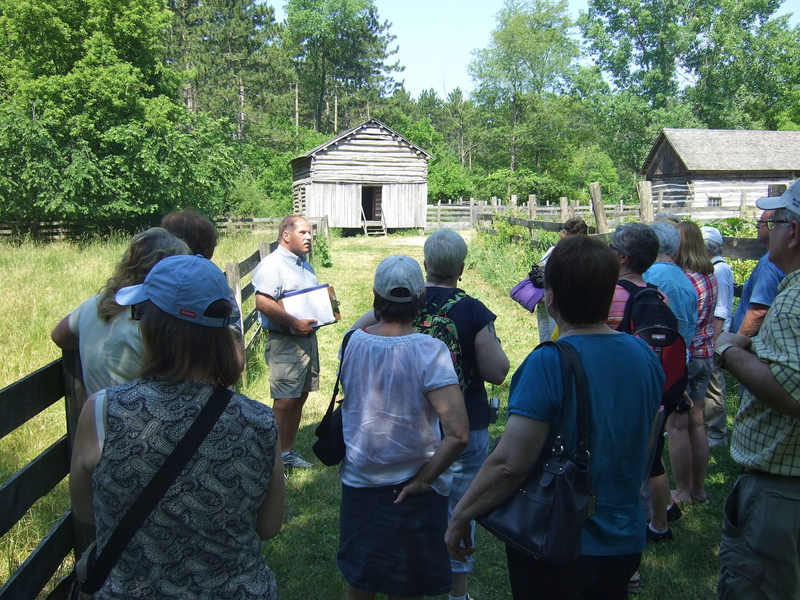 His work lives in in the historic structures and programs at Old World Wisconsin, and in the many people he inspired. 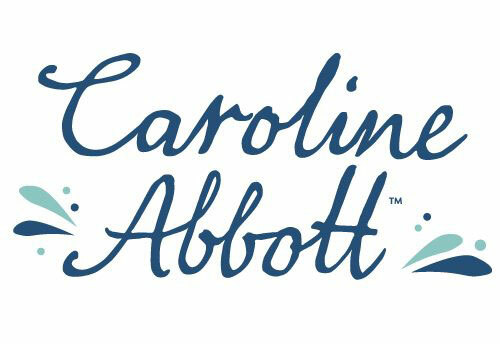 Lots of you have already heard the latest news: Caroline Abbott’s stories are set in 1812! That’s all I’m able to say about her for now. What I can do is tell you a little about the process for creating Caroline and her world. When I was invited to join the project, the editors at American Girl had chosen 1812 as the time period for the new character. Nothing else, including her name or where she lived, had been decided. I spent about a month doing lots and lots of research about that era. I read everything I could find: books written by modern historians, books written by people living during the chosen time period, letters and diaries. After that I met with the project’s editor and researcher at American Girl. We narrowed down possible locations for the setting, and—after getting feedback from other editors—we chose the location. Once that was decided, I traveled to do more research. Next, I created a proposal for each book, sharing my ideas for the stories. My proposals were read by several editors and the researcher. The editors have lots of experience with American Girl books, and they know what readers like. Once everyone agreed about the basic ideas for the stories, I began writing. When I finished the first draft of Book 1, I started on Book 2 while the editors and researcher reviewed Book 1. I did several drafts of each book. Each time, they got better. With all the back-and-forth, we were sometimes juggling three or four books at once! The researcher helped find answers to historical questions. Once I had complete drafts ready, the researcher also identified several content experts—historians who know a lot about the time and place I was writing about. They read the drafts and looked for any historical errors that might have crept in. The whole process of researching, writing, and revising six books about Caroline took over three years. One of the hardest parts for me was that everything was a secret! 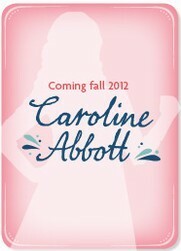 Next month, I’ll tell you more about the process of creating Caroline. Check back soon! In more recent times, historians have named specific old trees in certain places as witness trees. For example, a small honey locust sapling was growing on a Pennsylvania field during the Battle of Gettysburg in 1863, and it stood about 150 away from the speakers’ platform when Abraham Lincoln delivered the Gettysburg Address. The tree survived for 145 more years, providing visitors a tangible living link to those desperate days. Only a handful of such trees survive on the battlefield. 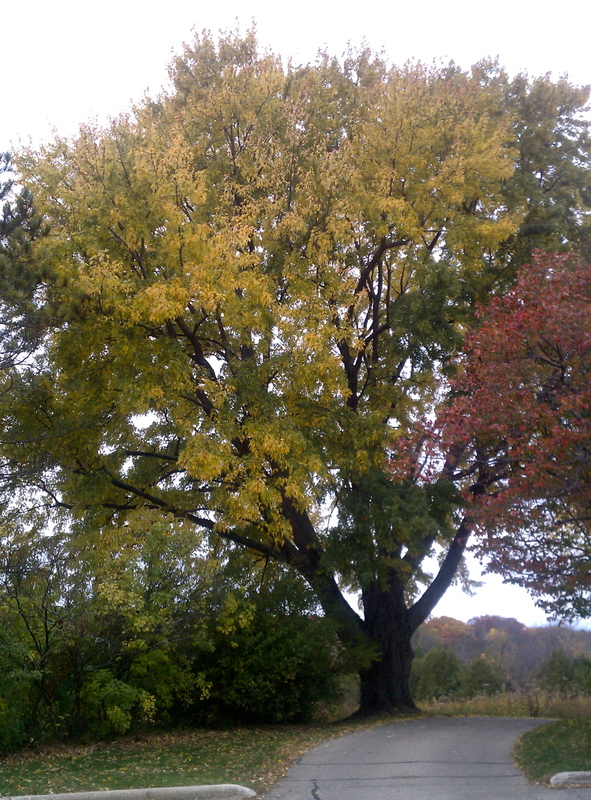 The honey locust is in the center. 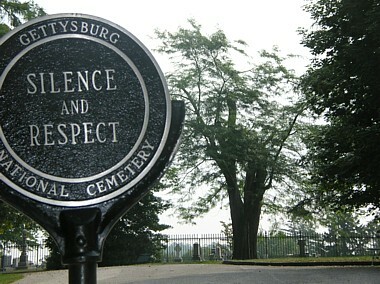 Gettysburg National Military Park photo, 2008, taken shortly after the storm that severely damaged it. I’m always on the lookout for grand old trees. Recently, while trying to meet multiple deadlines, I holed up for a few days at Holy Wisdom Monastery near Middleton, WI. 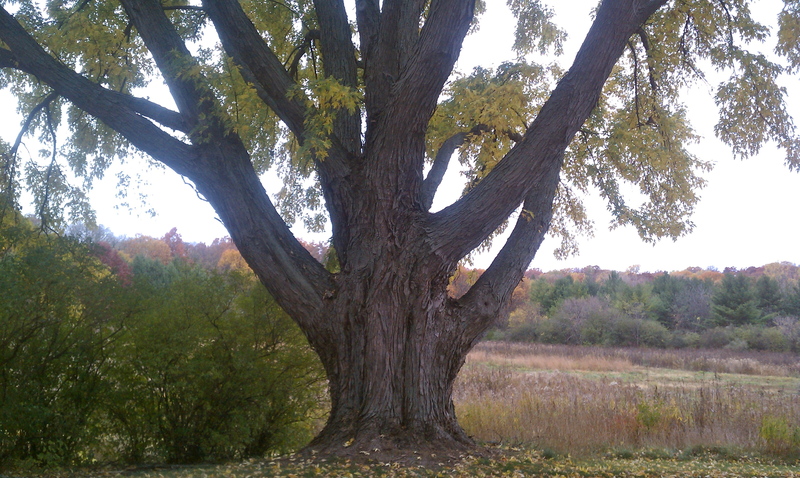 The 138-acre grounds include restored prairies, woodlands, a small glacial lake…and several witness trees. None are famous, as far as I know. But I find it impossible to contemplate these ancient trees without wondering about all they have seen. Pre-historic mound builders and Ho-Chunk travelers likely hunted here. Perhaps a young couple’s long wagon journey ended when they decided to build their cabin nearby. Maybe a family farmed this land, managing to hang on during World War I, the Great Depression, World War II. 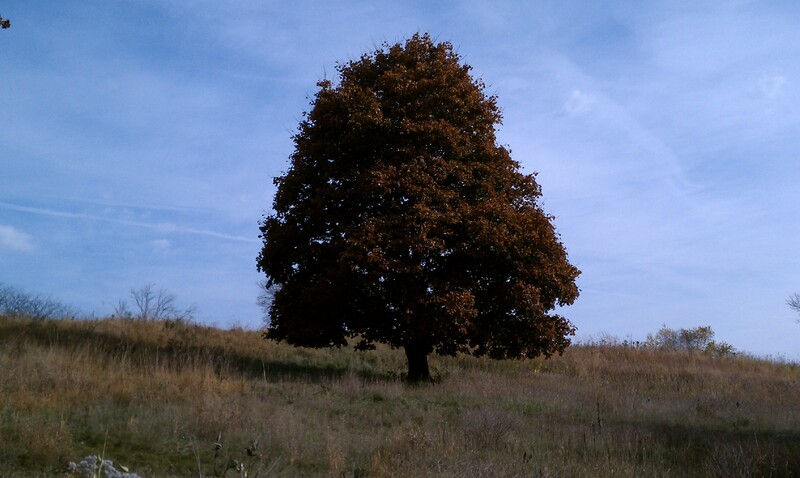 It's hard to get a grasp of scale, but this is one of the largest maple trees I've ever seen. In the 1950s, land was purchased by a community of Sisters of St. Benedict. 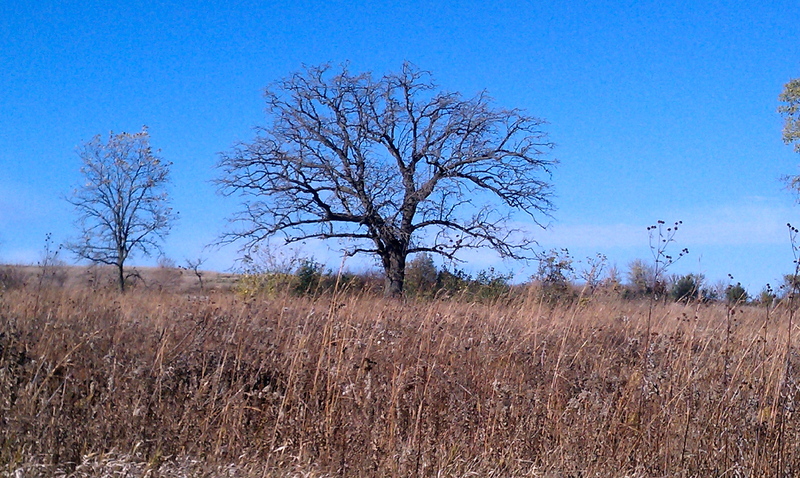 Today the Benedictine Women of Madison, an ecumenical community, lovingly maintain the prairie and oak savannah. And through all the changes, a few magnificent trees have remained. Trunk of the maple shown above. As I worked to finish the first draft of my next Chloe Ellefson mystery, I found that thinking about these trees and the lives they’ve witnessed was somehow inspiring. People continue to visit this landscape, each with their own story. Two weeks ago one of those travelers was me. I pressed a couple of autumn leaves to bring home. Maybe my brief stay left an ephemeral imprint in the continuum, too. How about you? Any witness trees in your area? If you’ve read Old World Murder, the first Chloe Ellefson/Historic Sites mystery, you know that the plot revolves around a missing antique ale bowl. 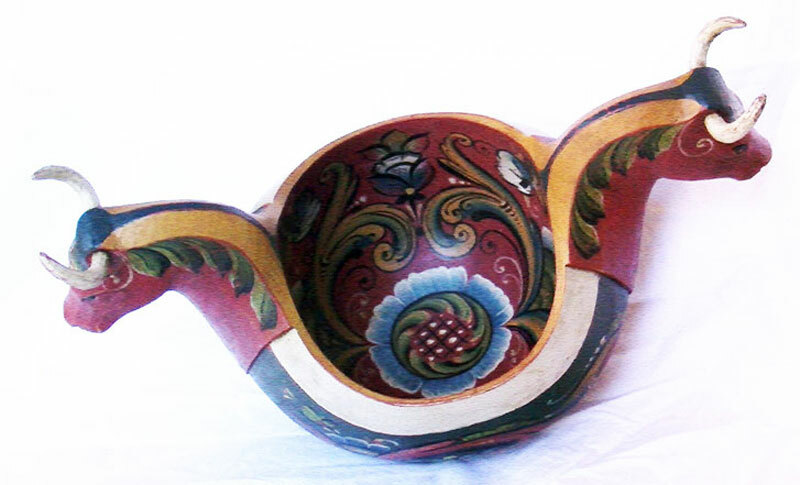 Ale bowls were used in rural areas of Norway during the period many immigrants came to America in the 19th century. They were used for special occasions, and were often beautifully carved and exquisitely rosemaled (painted). When Old World Murder was published, my husband Scott suggested that we commission a carver and painter to create the bowl described in the novel. It was a lovely idea, but after several discussions, I nixed the idea as impractical. Well, Scott ignored me. He surreptitiously made arrangements with woodworker Becky Lusk and rosemaler Judy Nelson Kjenstad. These two incredibly talented women worked from the description of my fictional bowl to create the piece. Scott gave me the bowl for my birthday. Surprise! The bowl is spectacular. Becky and Judy have both earned Vesterheim Gold Medals in their respective arts. 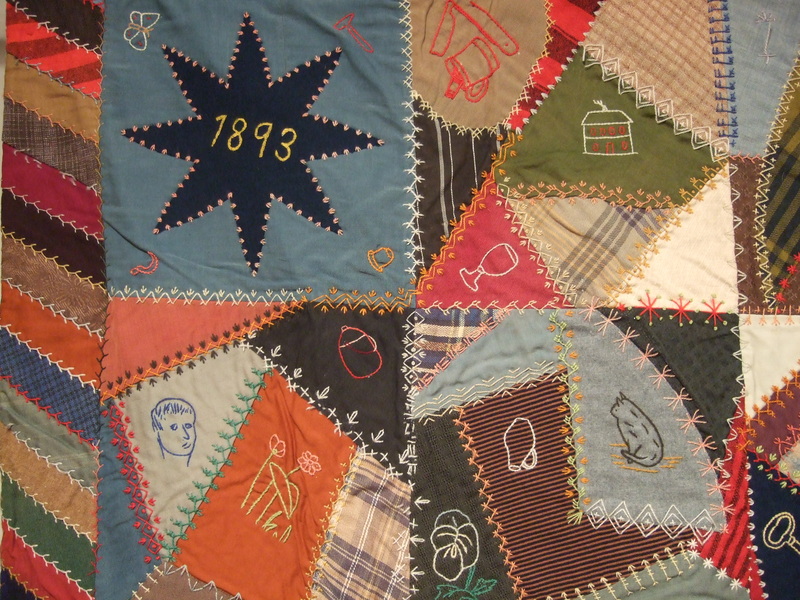 Vesterheim Norwegian-American Museum awards Gold Medals to artists who have repeatedly won ribbons in the annual National Exhibition of Folk Art int the Norwegian Tradition. These are coveted awards, earned only by those who truly excel. 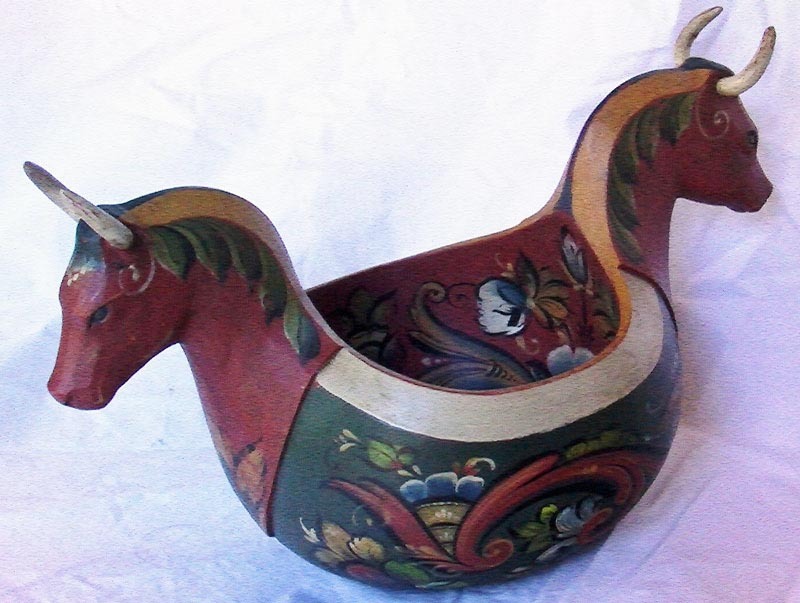 My new ale bowl is a beautiful piece of folk art for our home. I also look forward to displaying the ale bowl when I give programs. Since the novel was published last fall, lots of readers have asked what such a piece would look like. I think my favorite aspect of the gift, however, is Scott’s assertion that publication of Old World Murder deserved some kind of commemoration. He knows the publishing biz can be…shall we say…fickle. 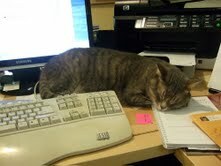 He’s celebrated high notes and successes with me, but he’s also seen me work hard on novels that have yet to find a home. He wants me to have a memento to remind me that this book did find a home with publisher Midnight Ink, launching a series I am enjoying immensely. When I think back on our earlier discussions about whether or not to have this particular bowl made, I realize he was right all along. I don’t think I’ve ever taught a writing class without invoking that phrase. How can an author whisk a reader into another time or place, without bringing the action to a clattering halt with a data dump of description? Invoke the senses. Sifting a few fresh details into a scene can instantly bring it to life in a reader’s imagination. I was reminded of that when Scott and I visited Old World Wisconsin’s Christmas program last Sunday. It was a great day weather-wise. The Crossroads Village, Yankee Sanford Farm, and Finnish Ketola Farm looked charming with a dusting snow. Some of the moments that are still most vivid, however, involved senses other than sight. 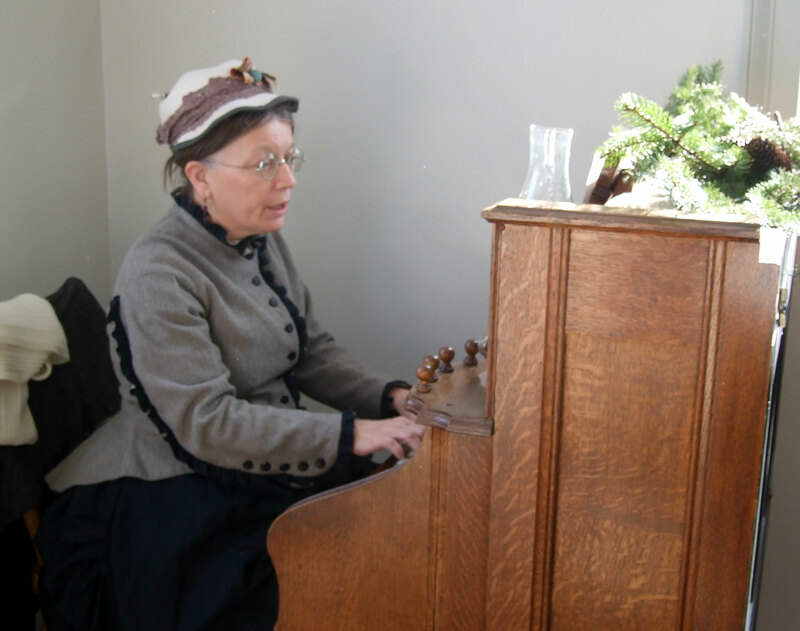 At St. Peter’s Church, we were treated to the sound of period music played on a 19th-century pump organ…. Bea Jacobson at the pump organ, St. Peter's Church. 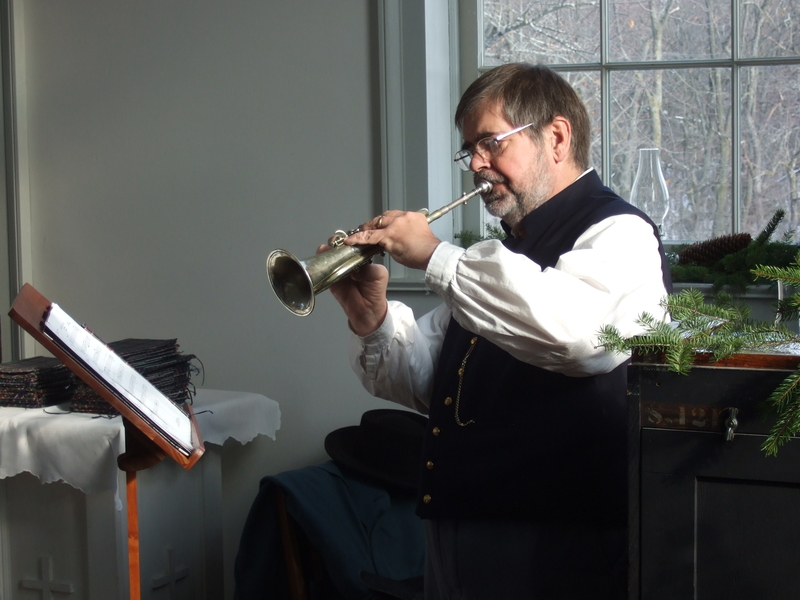 Ed Pierce, playing an 1855 cornet, St. Peter's Church. Anne Danko, preparing a holiday meal in the Sisel kitchen. 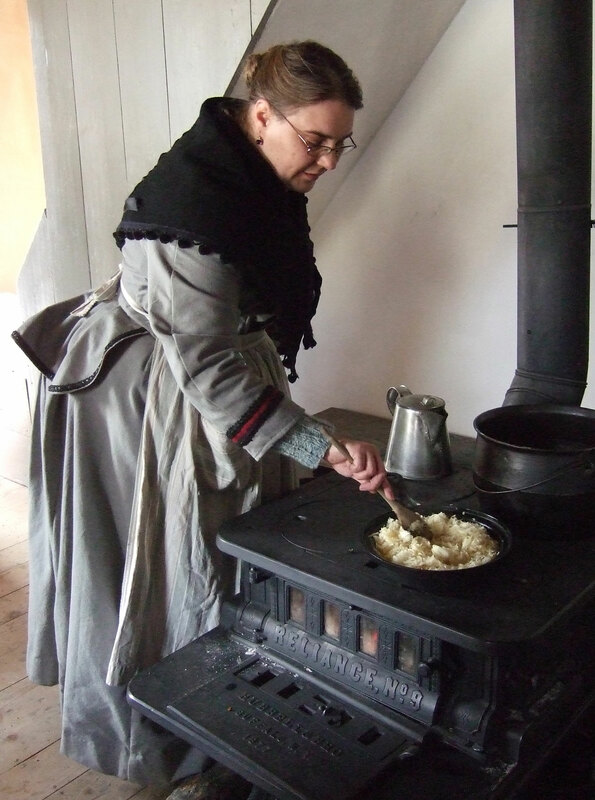 At the home of Bohemian immigrants, we were greeted with the sharp tangy scent of cooking cabbage. “Something stinks!” a small boy said, as he stepped inside. “Ooh, that’s good eating,” an elderly man countered. Whatever the reaction, the smell triggered quick reactions. Other food was being prepared as well, but the most pungent prompted the most comments. The Finnish sauna smelled of smoke when we arrived, since a fire had been built among the sauna stones earlier that afternoon. 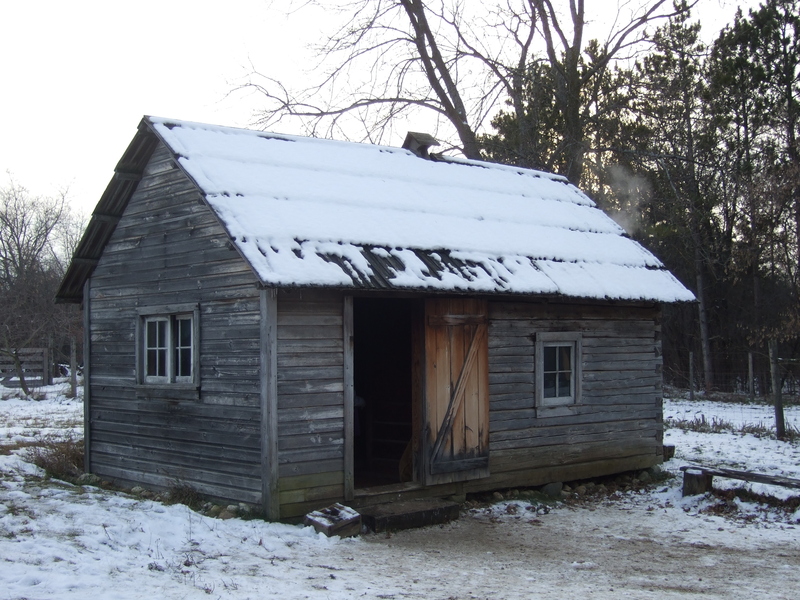 While we were inside the small structure, imagining the immigrants who once used the sauna in Wisconsin’s deep-snow northwoods, the interpreter poured water on the stones. The sudden burst of steam could be heard, seen, and felt! That's Karl Kaphengst, tending the firepit. We heard the hiss of cold water on hot stone. 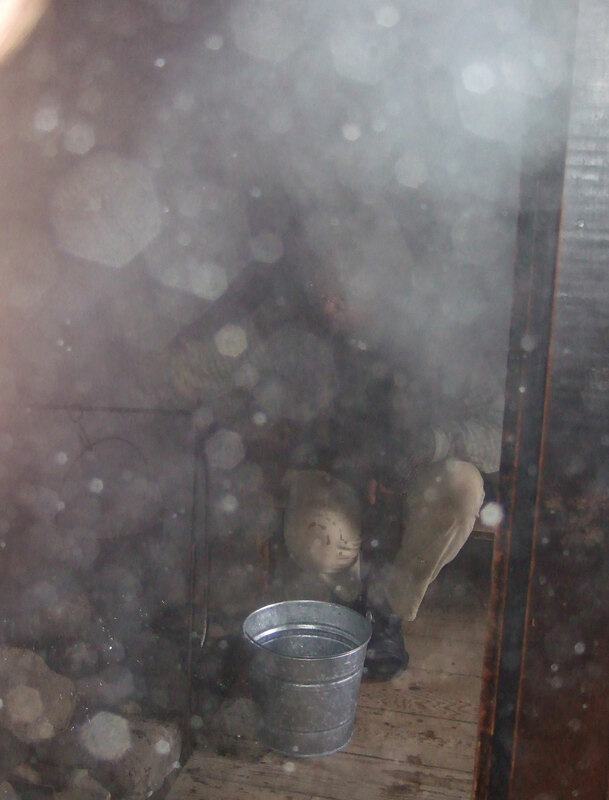 We felt the dry air turn moist against our skin, as steam displaced the smoke. We tried sitting on higher and lower benches, experimenting with the different temperatures. I often suggest that beginning writers train themselves to collect sensory details by keeping a writing journal. Every evening, write a brief description of something seen, heard, tasted, touched, and smelled. It’s a fun thing for diarists or journalists to do, also. Even after fifteen books, I often find that in rough drafts I’ve relied too heavily on visual description, and have neglected other senses. Visits to sites like Old World Wisconsin help remind me how to build upon that foundation. My first artifact. She's about 5" tall. I bought my first antique when I was about nine. No lie. My family visited a doll museum while on vacation. A case in the gift shop offered a few old dolls for sale. The doll pictured here captured my heart. As I recall, it was priced at about ten dollars. That was a lot of money for a kid way back when, but I had to have her. I think I blew my entire vacation stash that afternoon. I loved the doll because she wasn’t perfect. 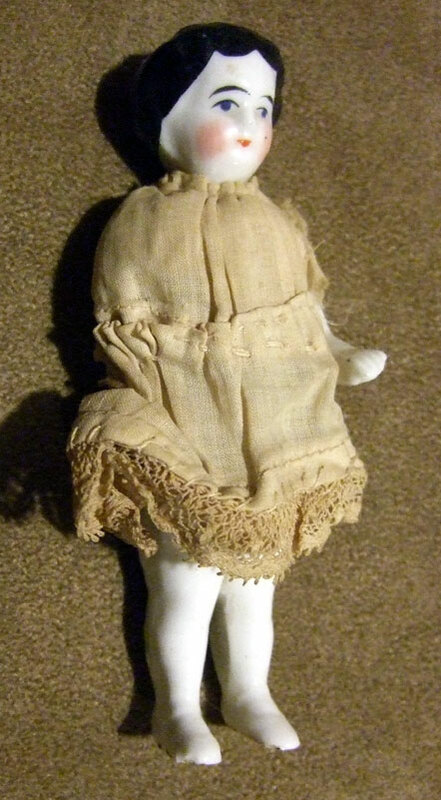 I imagined some long-ago little girl, heartbroken because an arm somehow got broken from her beloved china doll. I imagined the child tearfully stitching a new doll’s dress with one armhole. In my world, artifacts are most valuable for what they have to say about the people who once made, owned, or used them. That’s true for historical novelists, and it’s true for interpreters and reenactors. Most objects don’t offer such tangible clues as my one-armed doll does. But if we’re trying to engage readers and visitors, telling or suggesting stories can work magic. Facts and lessons and themes can come once folks are intrigued. Last Saturday, I showed my one-armed doll to 19 young historians. 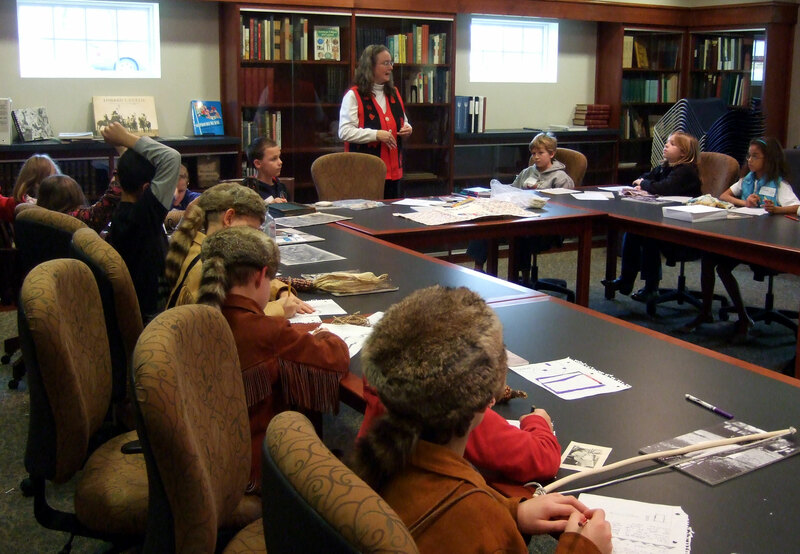 We’d gathered for one of the “Calling All Scholars” programs offered by the Hoard Historical Museum in Fort Atkinson, WI. What a joy—a room full of kids already excited about history! 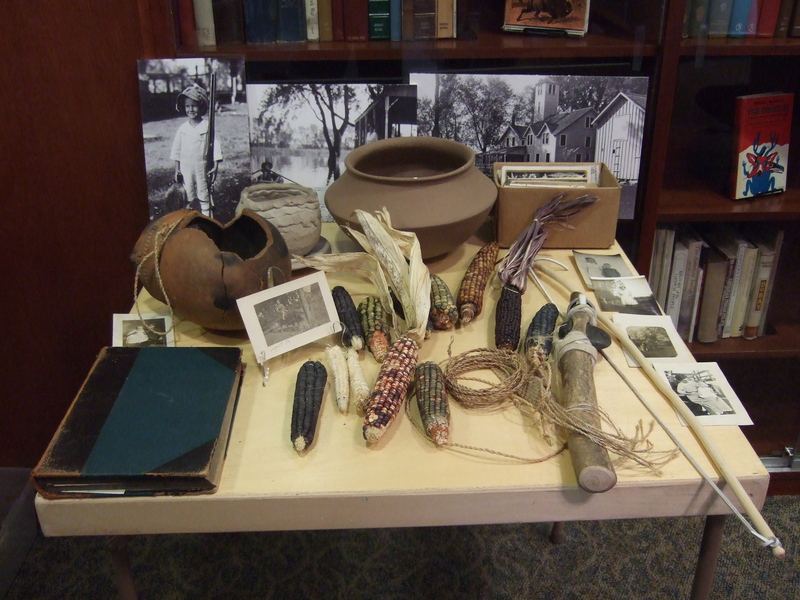 A few items from the Hoard Museum collection. Museum director Kori Oberle and I offered a variety of photographs and objects, and each child chose one of each. With just a little guidance, most were soon scribbling away…finding their own stories in the artifacts and images. It was awesome. Some of the young scholars, creating their own stories. They started by bringing a scene to life in their imaginations. Then they created a main character for that situation. I hope some of the students went home and finished their stories. And I hope that the next time they visit the Hoard Historical Museum, they wonder about the real people who inspired each exhibit, or left each artifact behind. The next time you visit your local museum or historic site, why not give it a try? The next generation of historical fiction writers, at the Hoard Historical Museum. I’m working on whittling a manuscript of 100,000 words down to something approaching 80,000. I actually don’t mind this kind of edit. Having to cut forces me to consider every scene, paragraph, sentence, and word. Do I really need it? Does it serve the story? One of the things to evaluate is backstory—events that shaped characters’ lives before the book’s opening scene. It’s essential to convey information readers need to understand the motivation driving a protagonist through the story. Slowing a story down with excess information is a problem. Sometimes a very fine lines separates those two things. As I work on this, I’ve been thinking about stories that interpreters related during my recent visit to Fort George National Historic Site of Canada, in Ontario. During the War of 1812, Fort George served as the headquarters for the Centre Division of the British Army. Interpreter in the enlisted men's barracks. This young woman painted a vivid picture of the day a regiment left Britain. The soldiers, who had enlisted for 21 years, were marched onto a waiting ship. If they were married, their wives and children waited on the dock. Then a lottery commenced. A few lucky women were chosen to accompany their husbands to North America. The rest knew that they’d probably never see their men again. The interpreter spoke of a pregnant woman who threw herself into the sea when her number was not selected. 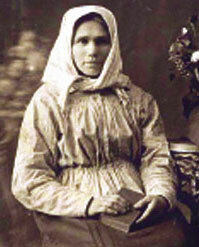 She spoke of wives who, although lucky enough to be chosen, were told that they could not take all of their children. In that heart-wrenching moment, some children were left behind to make their way on the streets, or to seek shelter in an orphanage. It is hard to imagine the grim necessity that forced families to face the enormous gamble that began with a married man’s enlistment. It’s also hard to imagine the chaos on the dock, and likely also within the ship, as children, women, and men listened for results of the lottery. Hanging blankets provided a family's only privacy. Children slept wherever they could find a spot. Wives and children were expected to work. These stories might be considered backstory for the people interpreted at Fort George. They worked because of their emotional resonance. They provided a new layer of understanding about the fort’s soldiers and their families—those who came, those who stayed behind. I’m hoping I can do as good a job of choosing bits of backstory to leave in my novel.